The sport of rowing in Warrington may well be traced back some 200 years but the modern era of rowing on the Mersey started in the autumn of 1985 when Andy Greenwell crept up the river in his single sculling boat to see if the river was a suitable stretch of water to row on. He came back with tales of a beautiful wide river with a few big bends and plenty of stream. The main advantage was that nobody else had the slightest bit of interest in using a river that had in its recent history been the dirtiest river in Europe. In the early part of the 20th century the town of Warrington had turned its back on The River Mersey. Just before Andy’s adventure on The Mersey, the local branch of the Rotary Club decided to stage an event on the river, to promote its existence and possibilities to the people of Warrington. A committee led by Rotary Chairman Kevin Donoghue with the help of George Fair, was put together to stage the aquatic extravaganza. They met at The Appleton Thorn Pub, a regular haunt of several members of Northwich Rowing Club. It was during one of these meetings that Richard Sinnott was drafted onto the committee as he, Andy Monks and Phil Fletcher were meeting in the same room for a post training drink. Richard quickly persuaded the committee to make the event a full blown rowing regatta, confident that he could get local clubs to come and try a new stretch of water. At this stage the local regional rowing council got wind of the idea and gate crashed the party. Warrington had been identified as an area for development and the interest being shown in a regatta was exactly what they had been looking for. The then President of The Amateur Rowing Association, Neil Thomas had worked for many years in Warrington and he was delighted to see signs of interest in the town. The Rotary led committee invited the local regional rowing council to get involved and at the first joint meeting Neil Thomas proposed the formation of a new club. Richard Sinnott was proposed as Captain of the new club (in his absence as he had popped to the gents). Kevin Donoghue, although a non rower, would be Chairman for the first year because of his local business contacts. Bill Waldren was elected President, as he was the owner of the riverside pub The Old Quay Tavern. Andy Monks and Phil Fletcher would be joined on the committee by John and Kathy Mills. The First Warrington Regatta The first regatta took place in July 1986 and was generally a great success. Although it did not raise the money the Rotary Club had hoped for, it did launch Warrington Rowing Club onto the map and a regatta has been held on the Mersey every year since. Interestingly the regatta was very much based at The Old Quay Tavern but the rowing part of the event was based on a scruffy piece of waste land by Kingsway Bridge, now the home of Warrington Rowing Club. 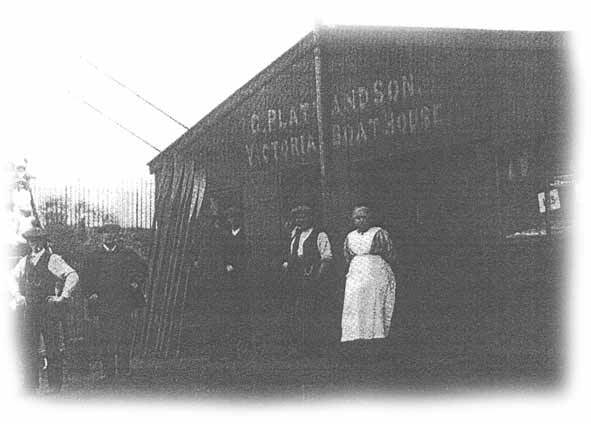 In the early days it was based at The Old Quay in Howley. Rent being paid by way of trade over the bar. Boats slowly began to appear, mainly on loan from neighbouring clubs, in particular Northwich, Grosvenor and Merchant Taylors. Clubs further afield were also very helpful with Leicester lending us a boat and Hereford also giving us a couple of usable boats. As funds were raised this allowed some very basic second hand equipment to be put in place - changing rooms were even added to the temporary boathouse at the Old Quay Tavern. The club wanted to be a competitive outfit from day one and as such the first Warrington crews took part in The North of England Head in 1986. The Old Quay Tavern changed hands and in the late 80’s the new owners gave the club notice to move on. This was a blow but it gave the committee a chance to get to the next step, i.e., its own boathouse. 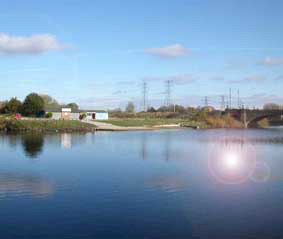 The site next to Kingsway Bridge, that hosted the first regatta, was earmarked. The Club obtained a short term lease from Warrington Borough Council. Three committee members guaranteed a loan of £3,000 from the bank. Buildings were the next problem. The club needed a big, long and strong building to hold a fleet of long thin boats, but had very little money. Dave Morris in collaboration with Paul Sutton, a local builder who gave his considerable time and expertise free of charge, came up with a plan. Three pre fabricated cottages in Hull, were purchased for £250 each, and moved to Warrington at a cost of £750; they were rebuilt into a long thin L shape. The effort of the club at this stage was enormous; members stopped rowing and became builders. Alasdair Elder, Tony Knowles, Bob Moon and Dave Cotterell were just some of the members who pulled out all the stops to help with the construction. Behind the scenes a huge amount of fundraising was needed Sharon Sinnott, Alison Clarke, Vicky Medland and plenty of others helped to raise the money. Plenty of local businesses helped and some who did not even know they had! The building project was finished in 1989 on the morning of The Regatta. As the first crews arrived for the event there was no electricity, water or sewerage. By the time the first race had started all three services were in place and working. In 1990 the boat situation improved dramatically, 2 brand new coxed fours arrived and took pride of place in the boathouse. One of these boats was built to be rowed by women. Warrington was one of the first clubs to buy equipment for ladies to row in. This is a practice that is now common place in all rowing clubs. The lightweight boat was a first in the area and gave notice that the club was going to get competitive. 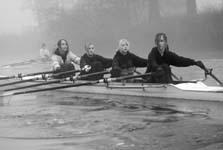 The club now also had several qualified coaches and the standard of rowing improved. A very strong Women’s squad emerged and even competed at Women’s Henley. From within this group a young lady, Helen Brown, emerged who would progress to win many National Sculling Titles and gain selection for The Great Britain Junior and Under 23 Rowing Teams. What was remarkable about this feat was that, at the time she was the club’s only junior and the club did not own any sculling boats. This was then followed by a group of young lads that performed at the highest level as juniors. The group included Jonathon Lidbury, Ric Egington, Mike and Phil Dostal. The brothers Mike and Phil would go on to win National Titles, with Mike going on to compete in the Rowing World Cup for Great Britain. Ric would go onto being a leading member of the British Rowing Team, becoming a multi World Rowing Champion and Olympic medallist. He would also carry on to be The Captain of Leander Club a huge honour as it is probably the greatest sporting club of any Olympic sport in the World. There was also John Acton a young man who would progress to coach Australia to a medal at the World under 23 Championships. All of these rowers spent their Junior years on The River Mersey as members of Warrington Rowing Club. They had also all fallen under the wing of Richard Sinnott who had started to develop a keen interest in junior coaching. Other notable members of the 90s included Liz Chick one of the best coxes Oxford ever had in a Boat Race. Head of the Mersey The Club decided to develop a Head of The River race and so in the early 90’s The Head of The Mersey was born. This popular time trial has become a regular event on the North West racing circuit and attracts a large entry every year. During the 90’s a well deserved Lottery Grant was awarded to the club and this helped fill the recently extended boathouse and gym. The club now had a good stock of boats and access to plenty of sculling boats, ideal for junior development. The club had by now developed a large base of qualified coaches and this was to be rewarded by the Amateur Rowing Association. They asked the club to be a pilot scheme for Project Oarsome. This was a scheme that linked rowing clubs to secondary schools and the governing body provided help to get a large base of junior equipment. The club adopted Bridgewater High School and the project initially ran well but soon ran into problems. The new century brought with it a new partner for Project Oarsome and junior rowing exploded into the heart of Warrington Rowing Club. Nick Halford, a pupil at Lymm High School, had talked his PE teacher into contacting Warrington Rowing Club. A short while later under the guidance of Andy McGlown, a humanities teacher, a new link was formed between Lymm High School and Warrington Rowing Club. The new partnership delivered strong staff links and an ever increasing pool of willing parents to help with the day to day running of the club. The school is able to offer large numbers of athletes to the club and the junior section has grown to be a major presence in the club’s activities. 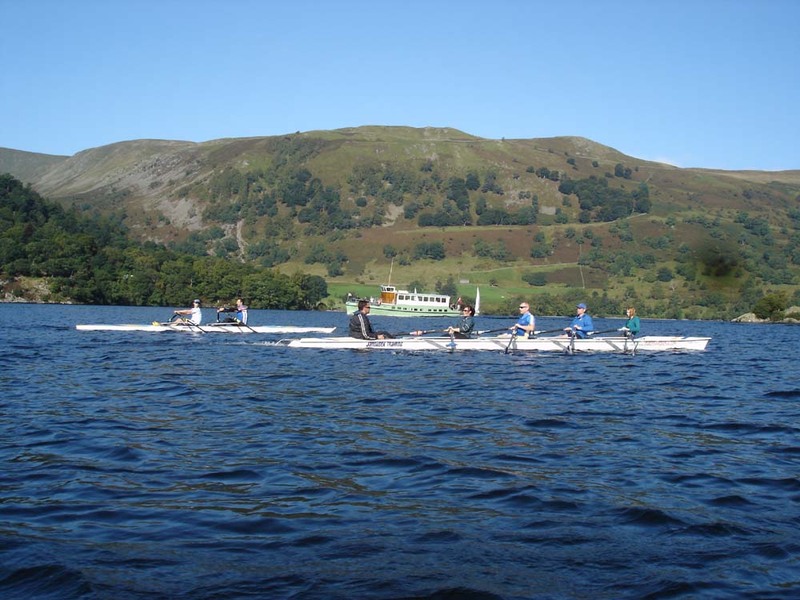 Since the establishment of the junior section the club has become one of the leading centres of junior rowing in the UK. Olivia Oakes was a product of Project Oarsome and she would develop to win National Titles and represent Great Britain at Junior and Under 23 Level. The junior section has always needed a lot of coaching and several names are worthy of note for their long service. Richard Sinnott, Martin Goswell, Andy McGlown and Emma Dunbavand, a young lady who had been a Project Oarsome junior at Lymm High School in the 00’s. Later developments at the club would see the arrival of recreational rowing. This is a scheme to encourage adults to come and have a row and enjoy the sport without having to submit to the rigors of competitive rowing. New changing rooms were commissioned in early 2012. This grand plan was marshalled by Graeme Atherton with his vision of shipping containers being used as building blocks. The containers form the basis of a new development alongside the existing building and once again the club has provided the labour. Interestingly old members Dave Morris, Phil Higginson and Alisdair Elder are involved again with the new building. A lot of the work is being done by well established members Graham Maclean, Dave Holder and long time helper Dennis Delooze.